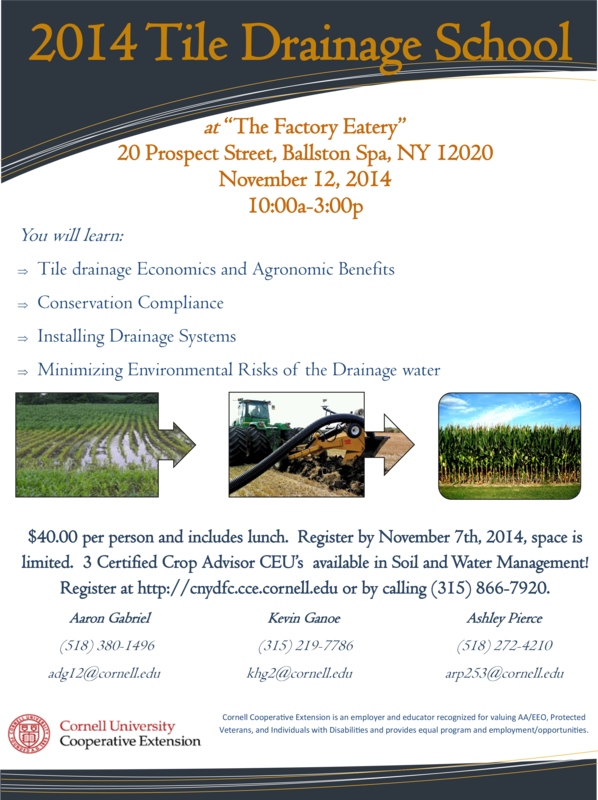 Northeast SARE Farmer Grants are for commercial producers who have an innovative idea they want to test using a field trial, on-farm demonstration, marketing initiative, or other technique. A technical advisor–often an extension agent, crop consultant, or other service professional–must also be involved. Projects should seek results other farmers can use, and all projects must have the potential to add to our knowledge about effective sustainable practices. To apply, visit http://www.nesare.org/Grants/Get-a-Grant/Farmer-Grant. Not gaining much in heat units the past two weeks 74 and 67 GDDs. Frost on September 19th with localized damage in low and high elevations in the southern part of the county and more broadly above Remsen. 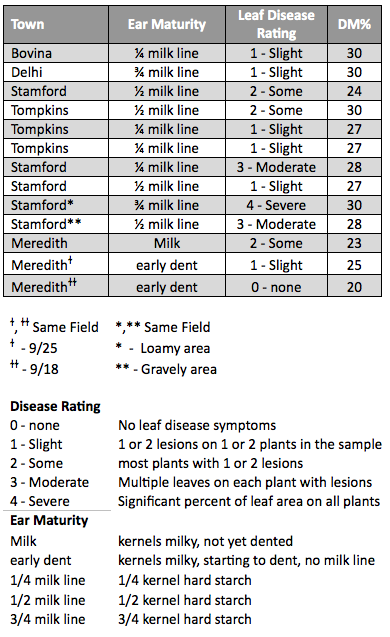 Dry matter event on the 19th 8 samples moisture of corn silage 71-75%. Last week temperatures ranged from 2 to 6 degrees below normal for most areas. Precipitation ranged from a trace to an 1 inch. 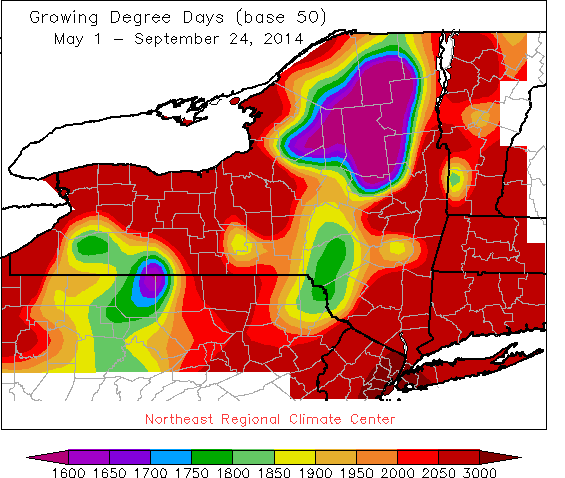 Base 50 growing degree-days ranged from 10 to 70. Low pressure moving up the coast will bring showers and possibly some scattered thunderstorms to southeast NY, the rest of the state will stay dry and partly sunny. Temperatures will range from mid-60’s to mid 70’s. Overnight temperatures will be in the low 40’s to low 50’s. Friday will be sunny and dry with highs throughout the 70’s. Low temperatures will be in the upper 40’s to low 50’s. Saturday will be sunny with highs in the 70’s with some areas possibly reaching 80. Overnight temperatures will be in the mid 40’s to low 50’s. Sunday will be sunny with temperatures in the 70’s and some low 80’s. Overnight temperatures will be in the upper 40’s to mid 50’s. Monday will be partly cloudy with highs in the mid 60’s to low 70’s with a slight chance of showers. Overnight temperatures will be in the upper 40’s to low 50’s. Tuesday will be partly sunny with highs in the mid 60’s to low 70’s with scattered showers possible. Lows will be in the 50’s. Wednesday’s highs will be in the mid to upper 60’s with scattered showers. Lows will be in the upper 40’s to low 50’s. The five-day precipitation amounts will taper from around 1” in extreme southeast NY to nothing in the Central Lakes/Northern Plateau and beyond. The 8-14 day outlook (Oct 2-8) is showing above normal temperatures and above normal precipitation for all but eastern NY. October and Oct/Nov/Dec outlooks are showing above normal temperatures, no indication for precipitation. There is still an abnormally dry area covering part of the Catskills and southern Hudson Valley. To make it easier to find posts, events, or stories specific to a region or county, each regional/county post will be tagged so that you may select just that region/county under the categories list (beginning with posts from August 1st, 2014 or later). The Capital Area Ag Report for September 11, 2014 is now available online. This issue focuses on harvesting corn silage and soybeans. Click here for the issue in PDF format.